Working half day is a great option for many people in different phases of life. Some use it because they are having small children and want to be more present, others use it to keep earning a steady income while they work on their new business during the other half day, and some use it as they go into retirement. For many newly divorced people, it’s a way to get back into the work force as they now need to make more money. I’ve personally done half day for 5 years over the span of my career for both maternal reasons and when I was starting my business. I also did it under 6 different bosses – 5 in one company and one in another. It can work very well, but it also can be really challenging. So I share with you the lessons I’ve learnt not only about how to go about it, why to do it, and how you can structure it. 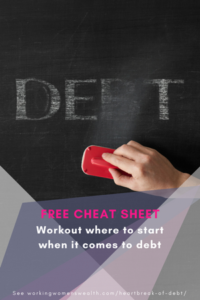 You need to know the pro’s and con’s before embarking on it. Lisa Linfield: 00:09 Hello everybody and welcome to this week’s episode of Working Women’s Wealth. Today we’re going to be chatting about half day. It’s such an interesting topic and it’s something that I’m absolutely passionate about because I’ve done it quite a lot actually. My first engagement with half day was when I had just had kids. So firstly after Jess and then after the twins. Then when starting my business I also went half day, so that I did a year where I worked half day and I worked on my business in the afternoon. I’ve had every experience you can possibly encounter. I have worked 4/8s, 5/8s, four days a week, I’ve worked afternoons only, I’ve worked mornings only, I’ve worked very and in different formations of it as I’ve had different needs, the companies had different needs, and as I also worked out what worked for me and what didn’t. Let me start by telling you why I think continuing to work and working half day is a great option. I guess the first one is quite practical and quite ruthless really because it is the effect that it pegs your salary. When you come out of this phase when you are wanting to go back to full-time work, you are able to not have to negotiate from a point of weakness. When I went from full day working to 5/8s working, literally my salary was made 5/8s and it was fantastic. So when I went from 5/8s back to the full day, my salary was literally adjusted for those remaining three hours. It enables you to peg your salary. You still get the company’s salary increases and therefore when it goes back up to the full day it’s not even a negotiation. That is huge because what I see is that people lose confidence when they step away from the work force, and especially if it’s a period of five years whilst they’re having young kids they often lose confidence not only in terms of their work, their abilities, and their knowledge of the market, but also they lose confidence in being able to negotiate that they are worth the same as they used to be worth. In that comes also what I think it’s fantastic because you don’t lose your confidence, you stay engaged in the workforce and you understand that actually not much changes over that period of time. You keep yourself up-to-date and you keep the connections that you had and you keep that workforce environment, and sometimes you can even keep your position. It’s a very good way to keep yourself in the work environment but also meet the needs, especially if you are for example a working mom. When I did it half day to start my business, it was a fantastic way to ensure that I still was able to earn an income but also set up my business. In fact, I worked in the afternoons half day then, because I wanted that my best quality thinking time was devoted to my business, and then in the afternoon I could use the energy of the people around me at work to create great work focus. That’s why I think working half day is a fantastic proposition, and I really, really urge everybody that has the opportunity to do it, that instead of giving up work, you continue to work half day. But there are things that you need to know, and firstly is that half day is usually earned, it’s usually related to your performance. So if you are slacking off, your company is not going to trust that you’re able to deliver the value in half a day. It is something that really needs to be known, is that it’s not a privilege to work half day, but it’s really flexible and it’s really beneficial. So you need to make sure that your performance before you ask for a half day job is great, is fantastic, and that your company is much more inclined to give it to you if they’re wanting to keep you on. It is quite difficult to find half day jobs. Having said that, I was recently looking for a half day person. It’s also very difficult to find people who want to work half day. It really is a performance related thing. It’s also not easy. You do not get the benefits of either being full day or being half day. When you’re full day, you manage your life, you structure that there’s no [inaudible 00:04:44] the children, that things are done for example on the weekend, you structure your life around being full day. And when you’re a full day parent, you come home energized to see your children because you haven’t been with them. Where if you’re a stay-at-home mom, you structure your life such that when they’re at school you can have time to yourself to collect your thoughts, do the things you need to do, and recharge your batteries then. When you’re a half day worker, you get the best of neither of those worlds. 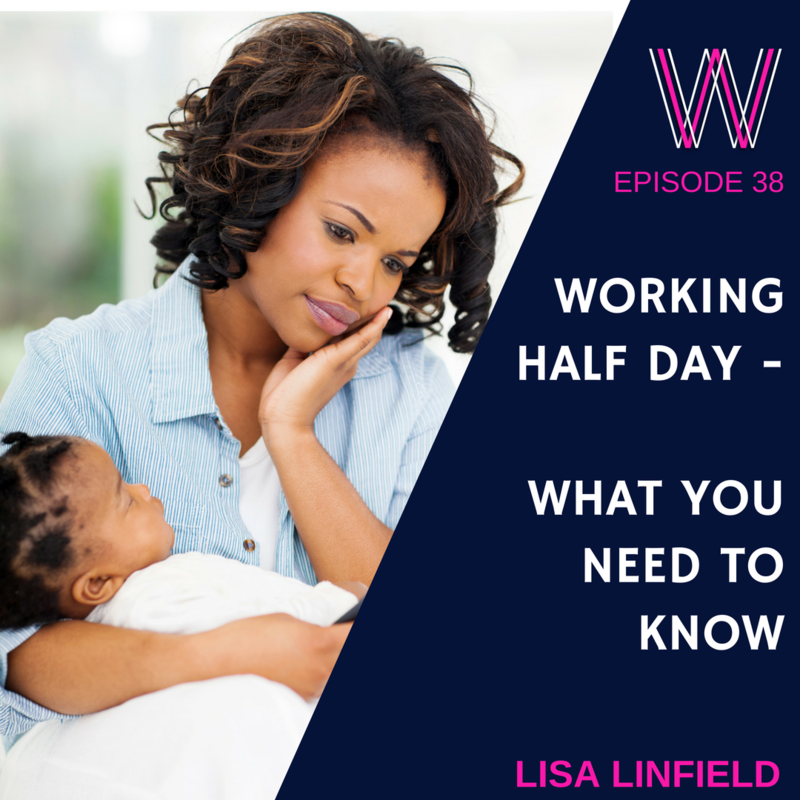 You work in the morning and then you come in the afternoon and devote all your time to your children, so you have nothing structured to support you and to relieve the pressure off you. You do the hardest portions of both jobs. So it’s not an easy option. You also need to know that in order to do it you need to do it properly, so that when you’re with your children you need to switch off. I remember when Jess was young. I always used to work when I was with her, and I remember that one time she looked up at me and I was actually in the middle of working and she burst into tears. And I really realized that if you’re going to do this in order to spend more time with your kids in the afternoon, you need to spend the time with your kids, and if you need to work, then work in the evening. But it takes a lot of discipline because everybody else is at work and you are not. It takes a lot of discipline to do it properly, to switch off when you’re with your kids. You also can’t expect to perform at the same level of your full-time colleagues. I’ve been on both sides of it. I’ve employed people who work half day and I’ve been half day and it is a really difficult thing because in the end you are not able to devote the same amount of time. You might overachieve for a half day person, but you cannot compete against a person who’s working a full day. It’s a very difficult time because you also can’t expect a perfect job that you might want in the sense that for many businesses that are operational, so call centers, et cetera, you can’t manage it half a day because lots of operational issues happen in the afternoon. So you need to understand that you might not necessarily be doing your perfect job through that period of time. The last thing you need to know is that you need to manage it, not your boss. You need to manage it. You need to understand that you’re going to need to say no because it’s very difficult as a boss to gauge exactly what’s fills a half day versus what fills a full day, and you’re the one that needs to say, “Actually I can’t do it.” I remember saying once to one of my bosses, I had worked half day and in that period actually we had five bosses in a year at a very senior level and I remember my new boss saying, “What do I need to know about you?” I said, “You need to know I’m schizophrenic.” And there was this pause, and this almost horror on his poor face, and I said, “One minute I’m going to want you to give me more work because I cannot switch off the ambition in me, and the next minute I’m going to tell you to back off. I only work half day and I cannot switch off the need to be a mom.” That is one of the real challenges of it, is that none of it is really being true to either your work self or your mother self, but it is a very, very, very good option for a time of life that for all of us to be honest is not an easy thing to balance all of it, to balance the work, to balance the home life, and to balance your desire to be at both of them. Here’s a few things that will help you with it. The first thing is to decide what it is. I worked first of all four hours out of eight which was 8:00 to 12:00. Then I decided actually that that wasn’t enough time. I was kind of getting stuck into stuff and having to go home. So what I ended up doing is working five hours out of eight Monday to Thursday and taking Friday off for half of a salary, but I was working Monday to Thursday five, so from 8:00 until 1:00. That happened to work really well, especially if it’s around children. Newborns often sleep between 12:00 and 2:00. It was no point me leaving at 12:00 and then coming home and sitting while the child was asleep. I worked 8:00 till 1:00 and then got home, did the stuff that I had to do between 1:00 and 2:00 and was there for the afternoon when she was awake. The thing I leaned from that marketing director is that make sure you are rigid in the beginning with how you stick to it, especially if you’ve gone from full day it takes time to train people. And you can train people. All people need is to be told no once or twice, and then it’s amazing how they can make a morning meeting that they’ve never been able to make. So for the very first month I always say to people you must rigidly stick to it. If your hours are 8:00 to 12:00, you leave at 12:00 regardless of whether you want to or not. Physically you must be out of sight. It’s hugely important if PAs are part of the corporate that you work in that you train the PAs. I can tell you something. They are the most wonderful human beings, and most times they understand you completely because 9 out of 10 times a person doesn’t run their diary, their assistant runs their diary. So I focus heavily on training the PAs where I went to each of them and I said, “You know, I’m terribly sorry, but I’m now on half day and so I can’t make that meeting. Would you be able to reschedule it?” When you are organized and when you look at and manage your calendar long enough in advance, what happens is that people are very willing to change the meetings, and it takes literally one month and then everybody is retrained. After completely being rigid and sticking to it, I then allowed a lot of flexibility afterwards. One of the things that I always believed is that if you’re an overachiever you are always going to work more than the physical hours you’re paid for, and that doesn’t stop when you’re a half day worker. So for me working overtime was always on my account. But there are especially in corporate times when your boss will say, “We need to go away for two days,” or, “There’s a full day strategy meeting,” or whatever it is, and I absolutely believe that you need to be there, you need to support your boss in creating the team bonding that happens in big teams and working teams. What I would do is my boss and I came to an agreement that I would attend all of those sessions, it wouldn’t even be a debate because they were always scheduled long enough in advance that I could arrange care and cover through that time, and then I would get leave in lieu for those half days that I was there. So if we went for two days off site I would get a day of leave. And I would make sure that I submitted that leave immediately the day after we came back because then it’s fresh in their minds. If you submit it four weeks later, he goes, “What was this for,” and it becomes an irritation. I allowed a lot of flexibility after that first month. Very seldom after that first month was that flexibility needed for a meeting, unless it was an external or off site meeting or client meeting it was very seldom for meetings. It was mostly for off site and strategy sessions. Then understand that each new boss will be trained. As I mentioned, in this one year we happened to have a lot of people in the business and I got new bosses. When you get a new boss, you have train them and their PA again. One of the things about that is understanding that you then flip straight back into this very rigid no compromise kind of first month and then it eases out for a while. The other people that you need to train are your employees. I was very blessed to be working a full, full day week, that’s why I say I’ve had every element of flexibility, and I worked Monday to Thursdays. Part of it was also training my employees. I ran a three billion revenue business at that stage, and I had employees, and they had to get used to having a boss that didn’t work on a Friday. There would be these little side comments which was, “Oh, I’d also like to take Fridays off.” Then I would counter them and say, “Yes, and then you can be paid 4/5s of your salary. You can lose 20% of your salary and only work four days,” and then it was like, “Oh, okay.” But I was absolutely able to run that business in that period of time, and it was just one of the things that I did, is I trained my employees, they all knew that if they got hold of me on a Friday or if I emailed or did any work on a Friday, that I was doing it without pay, that it was just part of what was allowed. And it was great because I used to actually work every Friday or most Fridays, but I got the ability or the gift to be able to drop my little girl at school and to pick her up and spend the afternoon with her. But I would often spend those three, four hours that she was at playschool working and catching up, and that work I’d usually do on a Saturday but now I was able to do it on a Friday and to have a full weekend with my little girl. So it was great, and yes, I did have a salary reduction, but again, when I came back full day I was then able to increase that salary. So I never lost the kind of market related salary for the work that I did. Your ability to add strategic value is huge. You might not be able to do operational type roles, but I landed a huge amount of fantastic work when I was working half day, and I guess also part of it is that your brain also has a complete change of scenery. That mental fatigue that comes with long 8, 9, 10 hour days didn’t quite happen. Yes, physically it was exhausted. I felt like I was wheeling from work to home to work to home to all of this and I was never on time for any one and never really being an overachiever in any one thing. But as I have come out of it, I have been hugely grateful for that experience, and I have been hugely grateful for the opportunity to have stayed in the job market through that period of time. As an entrepreneur it was fantastic to be able to set up my business and still work half day. Again, you’ve got to have the performance, you’ve got to have the drive and the ability to deliver, but what astounded me is always how productive I was through those periods, and it reminds one how important it is that your brain and your body and you get space in work, that working six days a week eight, 8, 10 hours a day is not the best for your brain because there’s times when I’ve worked half day I have been really creative and really energized because I had multiple different environments that stimulated me and it worked well. So bear that in mind. It’s a great option. It’s not a perfect option. It is very difficult. I always have said that working half day is more difficult than working full day or being a stay-at-home parent. It’s really difficult because you don’t get the benefits of either full-time parenting or full-time employee, but its benefits are huge and its benefits are huge if you need to return to work, which most of us will do. In this day and age, most of us are unable to not have two salaries in a house and so it provides a really great structure and framework, and most companies are very able to do it. But remember one thing. It doesn’t matter what the company policy is. Your experience of it will be your boss. I worked in the same company through all these different flexible structures and my different bosses had different reactions to it, and one of them said, “No, you can’t work part-time,” and I had to go back full day, but the other five or six bosses were fantastic about it. So really it’s human dependent and hugely related on your performance. 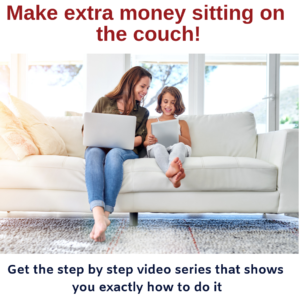 I’m Lisa Linfield, and this is Working Women’s Wealth, and I’d love you to go over and like our Facebook page, follow me on Instagram, or follow me on Twitter. It’s a great medium for which I can chat to you on different elements and where you can get to know me. Take care and have a great day.